iPhone 5s pre-orders opened up in China today, unlike the rest of the world which has to wait until Sept. 20 to get its hands on the new flagship smartphone, but in just a few minutes most models were spoken for. The news appears to confirm suspicions that Apple's iPhone 5s supplies are extremely limited, likely due to difficulties with manufacturing the device's fingerprint scanner. 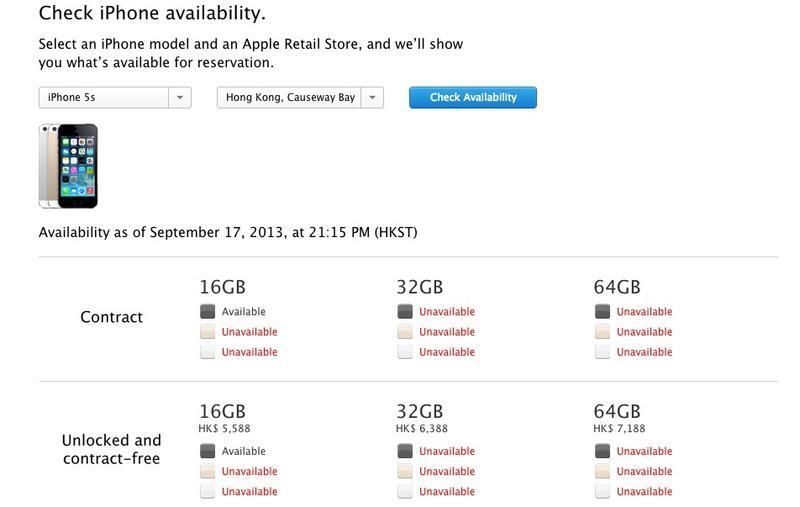 According to Apple's online store, all iPhone 5s models are currently sold out in China and Hong Kong except the 16GB Space Grey version both on contract and unlocked. It looks like Chinese customers prefer the silver and particularly the gold model of the new smartphone, defying predictions that consumers would view the gold-colored handset as gaudy. The news follows multiple reports from industry analysts, suggesting the device's built-in fingerprint scanner had slowed iPhone 5s production. Jeffries analyst Peter Misek warned that Apple's suppliers have reported cuts to previous orders due to "terrible" sensor yields, while Cantor Fitzgerald analyst Brian White added that the decision not to offer iPhone 5s pre-orders was an early red flag.